Columbia Police Department (CPD) investigators have arrested a 41-year-old man accused of not properly caring for his dog. 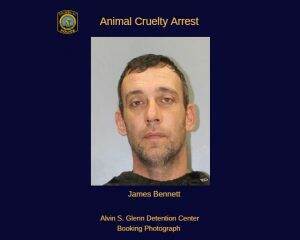 James Bennett (DOB: July 1977) is charged with Ill Treatment of Animals (SC Code of Law: 47-01-0040 (B) for allegedly neglecting a female pit bull named Sadie and failing to provide her with shelter, food or water for several days. Earlier this month, the dog escaped from the fenced-in area at a South Holly Street home and went to a neighbor’s house. The neighbor helped and cared for the dog, by taking it to a veterinarian’s office for medical treatment. After medically examining the dog, a veterinarian determined that Sadie suffered from neglect, starvation, and disease that could have been prevented. CPD seized the dog from suspect Bennett and transported her to the City of Columbia Animal Shelter for proper care, including warm shelter and food and water for nourishment.